To know what type of game your playing, and to get the most out of the money you're spending, it's worth taking a second to go over the different types of slot machine that we may encounter on a wander through the Nevada desert. Most often people only differentiate between regular slot machines and progressive slot machines, but there is more to the picture. You can learn more about a slot machine by looking at all the stuff going on on the front of it. What you're looking for is something called the payout schedule. If you like to not worry about multiple coin play, you should look for what is generally known as a multiplier machine. Looking at the payline, if you would be paid $5 for playing one coin, $10 for playing two, and $15 for playing three coins, it means there is no advantage to playing more than one coin at a time, and the machine is a multiplier machine. This is ideally suited for those who like to play one coin at a time. The most common slot machine in the casinos is the bonus multiplier. It's like its standard cousin, except you get paid more for playing more coins. Typically you would see something like $5 for one coin, $12 for two, $20 for three. You have to decide for yourself if the bonus given to playing multiple coins is worth your increase bankroll spending. Multiple payline machines can be a frustrating deal. These machines allow for winning lines in more than one spot. The classic example has three paylines, allowing for three different possible winning combinations. The problem is, many of these machines work on the premise of rewarding for more coins played. Each of the paylines is activated only if additional coins are added. The center payline will always be active as the first coin takes care of it. But if you put two coins in and those only happen to cover the bottom and middle paylines, then you hit a jackpot on the top line, you wont be paid a thing. Buy-a-Pay machines are a lot like multiple payline machines. In multiple payline slot machines you pay to activate each payline, in a buy-a-pay machine you pay to activate each potential level of jackpot. You need to play the maximum coins to activate the largest jackpot. If you're playing a buy-a-pay machine with less than full coins, you may have a heart attack. You can still 'hit the jackpot' and see the three moneybags line up in a row, but you wont win a cent unless you play full coins. 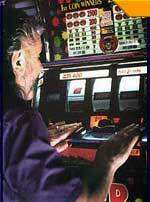 Progressive slot machines also often have a max coins catch. A lot of progressive machines will only offer the progressive jackpot if you're playing max coins. Be careful though because this may be the only feature activated by playing max coins, so you may not see it reflected clearly in the payout schedule.